Septic systems should be inspected and pumped a minimum of once every three to four year. A full septic tank may allow unwanted solids to flow into the drain field, which is the part of the system that consists of a distribution box, with a series of connected pipes. Each pipe allows water to flow into a bed of stone that drains into the ground. If paper and other solids flow into the drain field it becomes blocked and ineffective. A device that is installed to protect the potable (drinking) water from coming in contact with a questionable contaminant. When installed correctly and operating properly it will prevent contaminants from entering the potable water supply. Why does the backflow device have to be tested yearly? Any device that is mechanical is apt to fail and must be regularly checked and tested. The manufacturer suggests that testable backflow devices be tested yearly, and the Plumbing Code states that backflow devices must be tested at least annually. How do I determine if I have a water leak? Make sure all fixtures inside and outside your home are turned off. Then you can go out to your water meter open the lid and check to see if any dial is moving. You may need to observe this for several minutes. When no water is being used nothing should be moving. Even a small leak over a 24 hour period will amount to several gallons and a larger water and sewer bill. 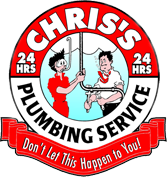 Contractors License #CF037168 | Copyright ©2018 Chris’s Plumbing. All Rights Reserved.